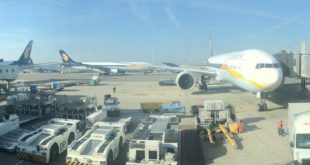 Mimicking the move from US airlines, Lufthansa Group’s frequent flier program, Miles & More, will be shifting to a revenue-based earnings model from March 12, 2018. In this model earning of miles will be based on the price of your ticket including any carrier imposed fees and surcharges, rather than the distance you fly. Under the old system, a flat number of miles for intra-European flights were awarded. 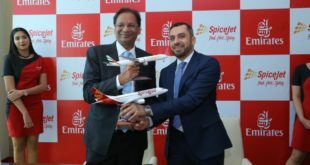 For flights involving non-European destinations like flights to and from India or to and from the United States or Canada, booking class and the length of the route determined the number of miles that were awarded. 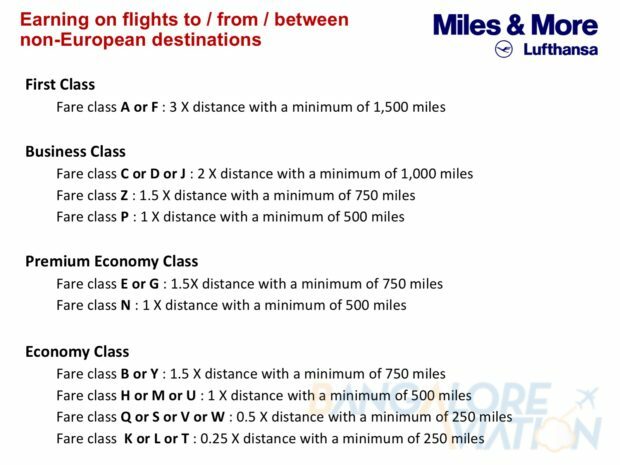 Lufthansa Miles & More programme current mileage earning system for different fare classes. The new system will calculate miles based on the fare paid including airline imposed fees and surcharges. 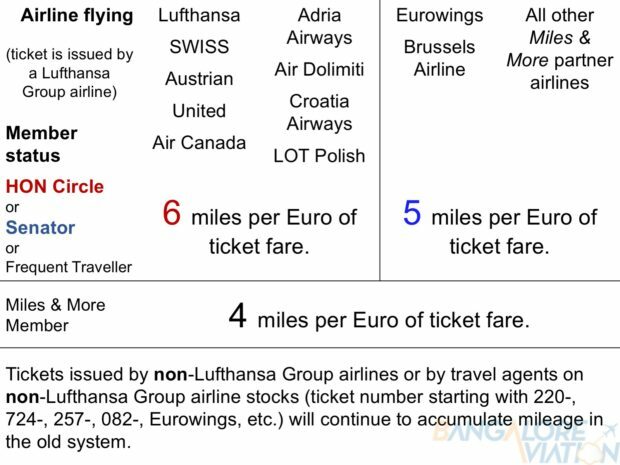 The fare will be converted to Euro as per the OANDA currency calculator and multiplied by a factor which ranges from four to six (infographic below explains it). 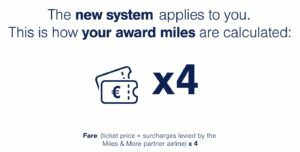 The new reward system applies to flights of the Lufthansa Group airlines Lufthansa, SWISS, Austrian, Brussels Airlines and Eurowings, as well as to all other Miles & More partner airlines, provided the ticket for the flight was issued by a Lufthansa Group airline. 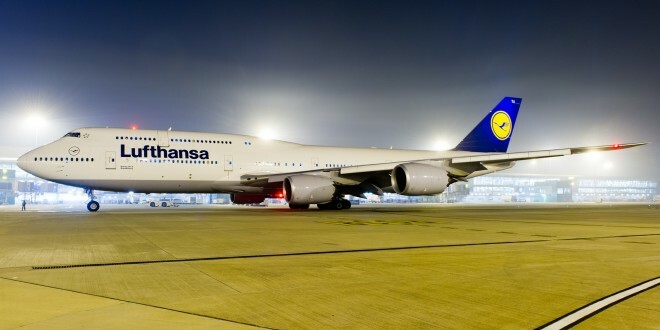 The new system will also apply to tickets issued by travel agents on Lufthansa Group airlines’ tickets. Ticket numbers starting with 220-, 724-, 257-, 082-, Eurowings, etc.). Travel agents will include online sites like Expedia, MakeMyTrip, Cleartrip, Yatra, etc. 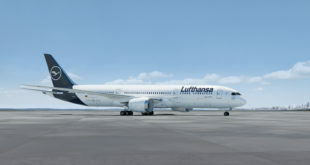 For tickets issued by non-Lufthansa Group airlines or by travel agents on non-Lufthansa Group airlines’ ticket numbers, the current distance based earning system will apply. We too got a little cross-eyed tying to decipher this system and have made this graphic to hopefully make it easier. HON Circle, select and status miles calculation? Will remain as it is as present. The new system will not apply to the calculation of status, select and HON Circle miles. Please visit Lufthansa for more information. Please share your thoughts on this change via a comment. In my opinion, Miles & More was already quite a tight-fisted and miserly program and this is not much of a change for the majority of people who fly in the economy class. This new program will surely benefit those fliers who pay the upper fare tiers of the their respective classes. In India, Miles & More has co-branded cards with Axis and IndusInd. These cardholders should consider their loyalty based on their flying patterns.